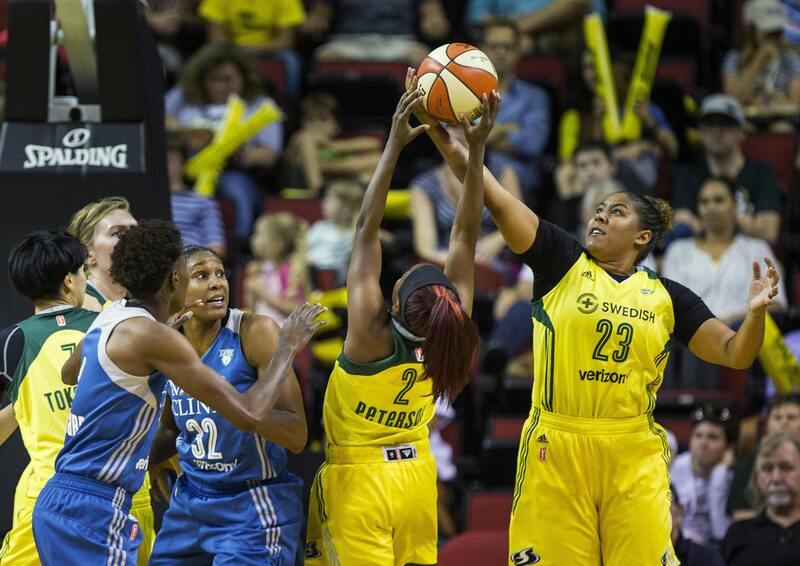 As two teams with high-powered offenses faced off, one already in the playoffs and one trying to get in, it turned out to be defense that won the game as the WNBA Seattle Storm defeated the visiting Minnesota Lynx 62-61. The Storm were coming off a rough five-game road trip where they lost the first four before finally overtaking the Phoenix Mercury in Phoenix last Saturday for a 98-89 win. The Mercury game was also the first one in three years without Jenny Boucek as Seattle’s head coach who was fired and replaced with interim head coach Gary Kloppenburg. Then on Wednesday morning Seattle’s Noelle Quinn found out she would be in the starting line-up that night replacing All-Star guard Sue Bird who was out with tenderness in her left knee. Though both teams had some shooting struggles it was the Storm defense that kept Minnesota’s offensively-minded team to a shooting average of 33.3%, a season low for the Lynx. In previous meetings the Lynx scored 100 points and 93 respectively but Seattle wasn’t going to let that happen again and Minnesota’s total of 62 points was another season low. 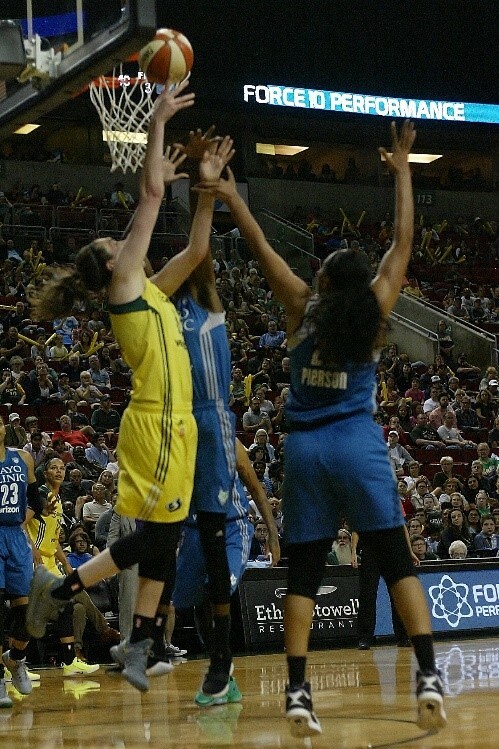 Seattle shot 42.4% and though Lynx center Sylvia Fowles, who Kloppenburg said was “like Shaq in our league” dominated the offensive boards with a game high eight it was Storm forward Breanna Stewart who dominated the defensive board grabbing 10. Seattle (12-16) had three players in double figures. Besides her total of 11 rebounds Stewart added 12 points to record her eighth double-double of the season, Loyd put in 16 points while forward Crystal Langhorne added 14 including the game-winner. With 55 seconds to go Loyd tossed in a running jump shot to bring the score to 60-61. Minnesota took the inbounds and the Storm defense went to work creating a missed shot by Moore and then keeping the Lynx on their heels to create a shot clock violation and turnover. 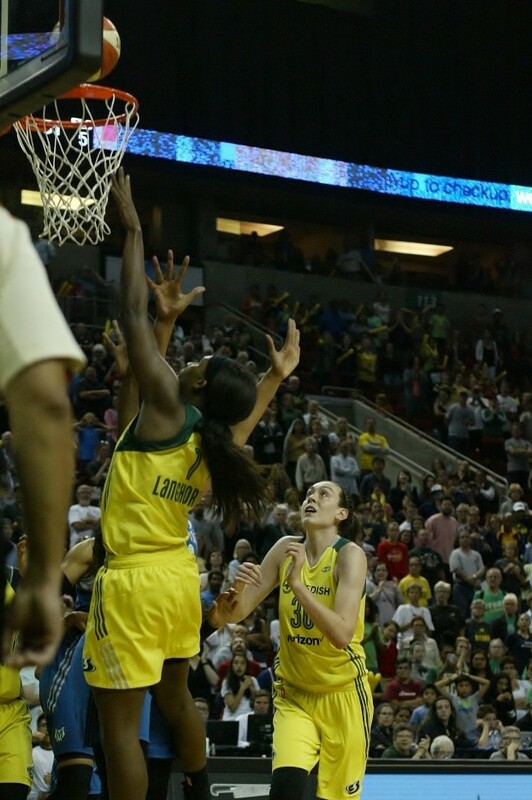 This gave Seattle the ball with 21.5 seconds left and after a timeout they brought the ball down with Loyd taking a jump shot that missed but Langhorne was there for the rebound and the lay-up to take the lead 62-61 with 11.1 seconds left. It was Minnesota forward Maya Moore who took the first shot with a 17’ jumper in the furious final few seconds where the miss was grabbed by Fowles who tried to score with a reverse lay-up but was thwarted by Seattle’s defense in the form of Stewart and Langhorne and the shot didn’t fall. Though the Lynx grabbed the rebound the lights went on around the basket and the buzzer sounded as Seattle put another one of their nemesis into the loss column. Minnesota had two in double figures with Fowles adding 13 points to record her 15th double-double of the season and Moore dropped 15 points and grabbed 11 rebounds for her third double-double of the season. The Lynx saw their record drop to 21-5 with this loss being their third in the last four games. With their first back-to-back wins since May the Storm will seek to continue the trend and seek some payback as they face off with former University of Washington star guard Kelsey Plum and the San Antonio Stars who have heated up late in the season including a win against Seattle in San Antonio just over a week ago. The Storm takes on the Stars at 7pm tonight at the KeyArena in their second-to-last home game and the Storm players it’s not just how well they play but how much they are lifted by their fans.